Annan Athletic pulled off one of the surprises in the Irn Bru Cup defeating the Celtic Colts on Tuesday evening. It was Annans first victory of the season and although Celtic were hampered by the sending off of Wallace Duffy in the 4th minute, Annan took full advantage with another polished performance with the highlight a stunning hat trick by former Queens Player Aiden Smith who secured victory with a stunning 84th minute strike. Annan opened the scoring in the 17th minute in a fine move culminating with Rabin Omar and Aiden Smith splitting the Celtic defence with some neat interplay and ending with Smith slipping the ball under Doohan in the Celtic goal. Celtics misery continued four minutes later when they conceded a penalty kick. Once again it was the pace of Smith which done the damage when he managed to get in front of Robbie Deas who’s challenge on Smith resulted in the penalty decision. Smith converted the penalty to make it an uphill struggle from here on in for the Celts. The young Celtic team pushed forward playing nice controlled football and in the 27th minute Alex Michell had to deal with a long range effort from Regan Henry. On the half hour mark Celtic made the breakthrough after Annan conceded a free kick 24 yards out and from this Regan Henry’s well placed shot flew into the top corner of the net. Celtic came close in the 40th minute when Mark Hill finished a patient build up with a low shot just past the upright, it was a close call for Annan but it was one of the few clear cut chances that the Celts made against a well drilled Annan defence. Annan started the second half well forcing a corner followed by a good strike from Aiden Smith which had Ross Dooham at full stretch. Jack Aitchison’s 55th minute effort sailed over the bar as Celtic prodded for an opening. Annan looked comfortable in containing Celtic and it was Annan who looked the most dangerous as they broke at pace from their shell with Omar and Smith up front a handful for the Celtic defence. Henry tested Mitchell in the 74th minute with a low raking shot but the keeper confidently saved the effort and almost immediately at the other end Omar twisted and turned to send in a low shot which was deflected for a corner kick. As the game entered the final 10 minutes it was Annan who looked the most dangerous, Omar tried a speculative 40 yard effort in an attempt to catch Doohan off his line but the keeper got back in time to save the shot. Annan secured the game in the 84th minute and it was Omar with a back heel into the path of Aiden Smith who sent in a glorious effort from the edge of the box into the top corner of the net to give Doohan no chance. 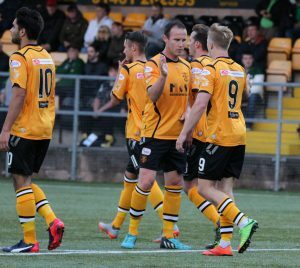 Annan Athletic – Alex Mitchell, Scott Hooper, James Creaney, Peter Murphy, Peter Watson, Steven Swinglehurst, Ryan Stevenson, Ryan Sinnamon, Aiden Smith, Rabin Omar, Brandon Luke. Subs not used Jim Atkinson (GK), Ellis Pearson, Jack Brannan Ayrton Sonkur, Owen Moxon, Raffi Krissian. Celtic: Ross Doohan, Wallace Duffy, Ross Deas (Ewan Henderson 67 min), Jamie McCart, Spephen Welsh, Mark Hill, Aiden Nesbitt, Kerr McInory ( Broque Watson 67 min) , Jack Aitchison, Regan Henry, Paul Joseph Crossan. Substitutes not used: Ryan Mullen, Lewis Bell, Michael Johnston, Grant Savory, Ciaran Diver.